I've played RPGs for a long time now. I'd be hard-pressed to name my first—maybe Shadowrun for the SNES—but either way they've been a presence in my life for a long time. Tabletop RPGs haven't been part of my life for quite as long, but I dabbled as a teen (I owned a set of Dungeons & Dragons books that I pretty much tried to hide in high school) and then started role-playing fairly regularly a few years back. I give you this information mostly so if you see me on the street you can justify why you feel the need to punch me in the face, but also because I think it's important background for what I'm about to say: No video game has ever captured the essence of tabletop role-playing. Which explains why I was so excited when I left my demo of Sword Coast Legends last week. What we think of as a video game RPG is a pale imitation of tabletop RPG. The basic rules are the same: You create a character, imbue that character with certain stats, then explore an area while relying on those stats to survive. And there are things that a computer RPG does better—you become a character, without needing to dress up or put on a silly voice. But it's static. A video game is coded, and then it is that thing. If you play on this difficulty you'll find these creatures in this dungeon and get this reward. You can add an element of randomness to the proceedings, but even that randomness is governed by its own rules. If you'll allow me an analogy: A video game is like watching a movie. It's all scripted, and you're just playing your part. Tabletop is fluid. It's improv, and the key to proceedings is the dungeon master or DM. A good DM is constantly adjusting the rules on the fly, maybe faking dice rolls or inventing new rolls to accommodate first-and-foremost whatever will make the game most fun for players. Sword Coast Legends lets you play dungeon master. Okay, a bit of back-story. 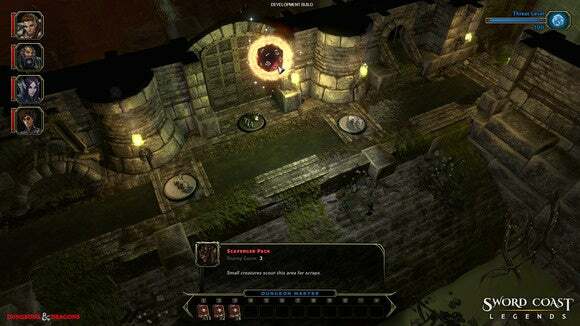 As you might have guessed from the name, Sword Coast Legends is an officially-licensed D&D product, and it's an isometric CRPG with active-pause combat, just like Baldur's Gate. Mmm, you already have me hooked. The developers over at n-Space showed me a bit of the campaign—which is based on the Fifth Edition ruleset so no THAC0—and I'm sure I'll be excited to try it out. It's (according to them) lengthy, the primary path is fully-voiced, the character banter I saw was well-written, and—oh hell, I'm always down for another isometric CRPG. We've had quite a few of those recently, though! 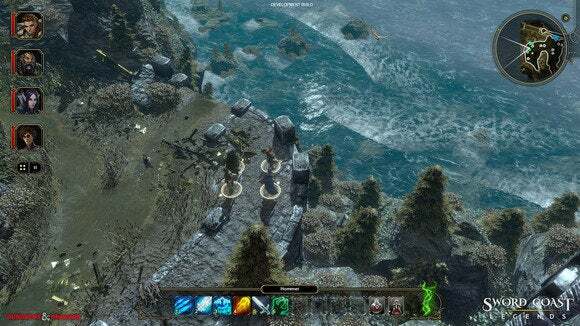 The isometric CRPG is back. I think we can stop hemming and hawing about that fact now and just state it flat out. Somehow the genre, with the help of Kickstarter, has crawled its way out from the ashes of Black Isle and Interplay V1.0 and emerged reborn. 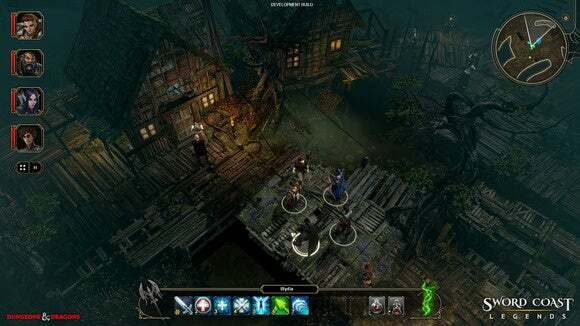 Wasteland 2, Divinity: Original Sin, Pillars of Eternity, Shadowrun—it's like the glory days of 1997-2001 have come again. What makes Sword Coast Legends special is something I barely—barely—got a glimpse of: DM Mode. DM Mode accommodates four players and one dungeon master, though it can also be played with as little as one player and one DM. On the player side, nothing really changes from a standard isometric CRPG. You're placed in a dungeon, you've got your party of four characters, and you're trying to make it to the end and defeat the boss. Easy enough. But what separates DM Mode from a normal dungeon is that a player is coordinating all of the defenses. The DM has an eye-in-the-sky look at the procedurally-generated map and can spend points to affect all sorts of things, be it hiding the entrance to a secret treasure room, placing monsters into a room, adding an ambush to a monster encounter, setting traps on the ground, or just locking doors to prevent players from rushing. Here's an example of a DM setting up an encounter. Notice the floating d20 in the sky, which (as far as I could tell from my demo) will randomize monsters. And what I found even more interesting is that the DM isn't supposed to win necessarily. I asked the developers at n-Space specifically, because it seemed like the DM could just throw a bunch of high-level monsters into an early room, kill all the players, and call it a day. While that's a possibility, the developers told me the DM's goal isn't winning—it's to maximize fun for the players. The DM will be rated at the end of every match, and the goal is for players to feel like they had a good time even if they lose. They should feel like the DM was challenging, not cheating. In other words, it works like a real DM. The dungeon master in a tabletop game isn't trying to win, but tell a story or guide the players through an encounter. 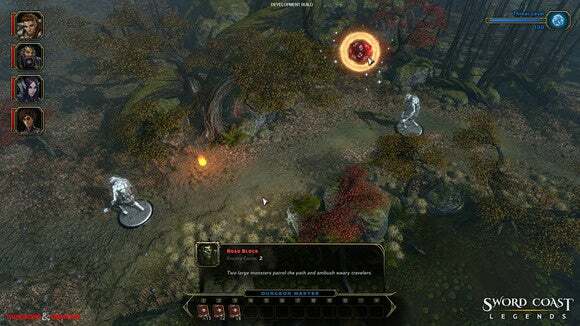 To this end, Sword Coast Legends actually lets you demote or even delete enemies from a battle if it feels like the players are getting overwhelmed. It doesn't have the same flexibility as actual tabletop role-playing. There's still not a ton of room for improvisation. You won't somehow manage to make it over the spike trap as a player by using your ten-foot pole as a pole vault, governed by a dexterity role, for instance. But all the same, it's a human element to dungeons that should both make the game more challenging and more fun. It also immediately brings up a whole host of questions. Can I make custom maps? Can I mod in custom enemies? Can I create entire campaigns with story elements? And most importantly, can I play through the "singleplayer" campaign in DM mode? Unfortunately, n-Space is being tight-lipped about all of those questions. I tried. I really did. This is one to keep an eye on, though. I'm fascinated by the possibilities of DM mode, and I hope in practice it turns out as interesting as it looked during my demo. 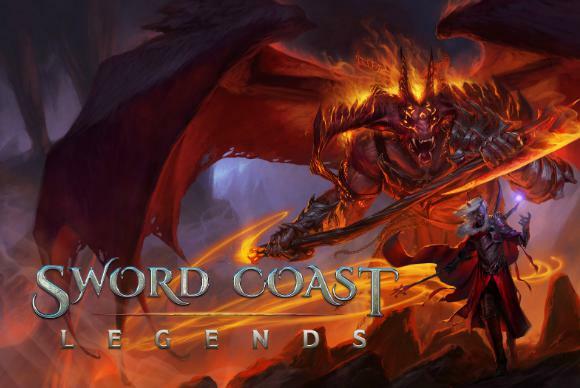 We'll hopefully get more details about the game around E3 or PAX, and as of now Sword Coast Legends is scheduled to be out later this year.